We are now in the age of rapid deployment of renewable energy. The cities, states, companies, and countries that move fastest to run their economies on fuel that is abundant and free, will clearly lead the new century. The cheapest energy available today comes from wind and solar, with some competition from natural gas, – but gas has not been nearly as dominant as experts expected just a few years ago. It’s a welcome development for those of us who worry about the effects of further burning of fossil fuels. But there is an organized, well funded and strategized campaign to slow the growth of renewables, directed from Washington DC think tanks, and funded by the coal industry. I’ve been ramping up my communication efforts locally to push back against a well coordinated paranoia crusade. What we are seeing across the midwest are social-media organized “flash mobs” showing up at normally-sleepy township planning commissions and shouting down, threatening and intimidating local boards who are not accustomed to organized ugliness. The scenes are very reminiscent of the anti-Obamacare “Keep the Government out of my Medicare” mobs of 2010, and generally just as poorly informed. The “Anti” above announced before the show that “6 months ago I didn’t know anything about this, but I’ve been doing research on the internet”. Which accounts for his certainty that wind turbines “sound like chainsaws”, and a peculiar focus on Canadian wind factoids, an artifact of a large and active windbagger group in Ontario, well represented on Facebook. I’ve posted before about some of the most ridiculous anti-wind BS. See more below, and at wind101.info. NEW technology has long attracted “modern health worries“. Microwave ovens, television and computer screens and even early telephony all caused anxiety in their time. More recently, cellphones and towers, Wi-Fi and smart electricity meters have followed suit. Another is gathering attention; the very modern malaise known as wind turbine syndrome. I set out to collect the conditions attributed to wind farm exposure. Within hours, I’d found 50 often florid assertions about different illnesses. Today my total sits at 198, with a range redolent of Old Testament plagues. The list includes “deaths, yes, many deaths”, none of which have ever come to the attention of a coroner, cancers, congenital malformations, and every manner of psychiatric problem. But mostly, it includes common health problems found in all communities, with wind turbines or not. These include greying hair, energy loss, concentration lapses, weight gain and all the problems of ageing. Sleep problems are mentioned most, but insomnia is incredibly common. Animals get a look in. Chickens won’t lay; earthworms vanish; hundreds of cattle and goats die horrible deaths from “stray electricity”. In a 35-year career in public health, I have never encountered anything quite so apocalyptic. I’ve visited wind farms and compared their gentle swoosh to the noises that all city dwellers live with daily. Quickly, this phenomenon began to tick psychogenic boxes. There are several reasons to suspect that the unrecognised entity of wind turbine syndrome is psychogenic: a “communicated” disease spread by anti-wind interest groups, sometimes with connections to fossil fuel interests. People can worry themselves sick. Firstly, there are the temporal problems. Wind farms appeared some 20 years ago in the US. There are now just shy of 200,000 turbines globally. But the first recorded claims that they caused disease came a decade later. Two rural doctors, one in the UK and the other in Australia, made claims repeated widely in newspapers but never published in any journal. Turbines have come to be blamed for chronic conditions like (amazingly) lung and skin cancer, diabetes, multiple sclerosis and stroke. But importantly also acute symptoms, that according to Australia’s high priestess of wind turbine syndrome, Sarah Laurie, an unregistered doctor, can commence within 20 minutes of exposure. If true, what happened in the early complaint-free years? Then there’s the issue of clustering. The European wind industry sees the phenomenon as largely anglophone, and even then, only in particular regions and around certain farms. Many sites have run for years without complaint. Others, legendary for their vocal opponents even before start up, are hot beds of disease claims. So if turbines were inherently noxious, why do they cut such a selective path? Why do citizens of community-owned turbines in Germany and Denmark rarely complain? Why are complaints rare in western Australia, but rife in several eastern Australian communities? Opponents readily concede that only a minority of those exposed report being ill but explain this via the analogy of motion sickness: it only happens to those who are susceptible. How then to explain that whole regions and indeed nations, have no susceptible people? The key factor seems to be the presence or absence of anti-wind activists, generally from outside the area. It is clear the presence of these anti-wind “vectors” is required. Communities which have for years accepted the farms can erupt when activists arrive, spreading alarm and listing health problems. Prominent among these in Australia are wealthy conservative landowners appalled by the very visible presence of the tall green-energy totems, a constant reminder of bucolic decay and the “upstairs-downstairs” disdain they have for those needing income from their often hilly, poorer quality land. The fact that money seems to be a magic antidote to these ailments further undermines the claims. Health complaints are as rare as rocking horse excrement among turbine hosts. Complaints are rare from those financially benefitting from communal ownership arrangements. It tends to be neighbours of those hosting turbines who make the link with illness. They see the turbines, dislike them and dwell on their misfortune. The perceived injustice can eat away at some, fomented by organised groups. Excellent. Well-deserved bright hot light on a major issue. In the Town of Falmouth, MA, two wind turbines were erected on public land, and were operating. I visited them. There was a 40 knot wind blowing. I walked completely around them at a distance of 100 feet from the columns. Through process and litigation, opponents not only managed to make the Town cease operating these, they are presently scheduled to be deconstructed. Public discussion continues to argue that these turbines are an acoustic nuisance, and are pursuing ways of collecting damages from authorities and companies which they claim hid evidence of excessive and what they consider dangerous amounts of noise. These claims are contrived bupkis. Thirty years of North American research on public acceptance of wind energy has produced important insights, yet knowledge gaps remain. This review synthesizes the literature, revealing the following lessons learned. (1) North American support for wind has been consistently high. (2) The NIMBY explanation for resistance to wind development is invalid. (3) Socioeconomic impacts of wind development are strongly tied to acceptance. (4) Sound and visual impacts of wind facilities are strongly tied to annoyance and opposition, and ignoring these concerns can exacerbate conflict. (5) Environmental concerns matter, though less than other factors, and these concerns can both help and hinder wind development. (6) Issues of fairness, participation, and trust during the development process influence acceptance. (7) Distance from turbines affects other explanatory variables, but alone its influence is unclear. (8) Viewing opposition as something to be overcome prevents meaningful understandings and implementation of best practices. (9) Implementation of research findings into practice has been limited. The paper also identifies areas for future research on wind acceptance. With continued research efforts and a commitment toward implementing research findings into developer and policymaker practice, conflict and perceived injustices around proposed and existing wind energy facilities might be significantly lessened. I have visited the 5-turbine wind farm run by the Atlantic County Utilities Authority on the grounds of its wastewater treatment facility on the bay side of Atlantic city and visible from every part of town including the casinos. I agree with your opponent and I thought your case was mostly argument from authority, but kudos for being willing to debate. you agree that wind turbines sound like “chainsaws” and are “10 times as expensive” as alternatives? You’ve told me all I need to know about your objectivity. I will continue to cite “authorities”, since expertise, experience, data, and fact are always our best guides, as opposed to unsourced Facebook nonsense. I can’t find in the video where the guy says wind turbines sound like chainsaws, but my attention span probably isn’t all that great. My own experience with wind turbines is that from a thousand feet away or so, when the wind and angle is just right, they sound sort of like a jet airplane flying by. Perhaps it’s turbulence caused by a gust of wind. I will let slide your comment that your “attention span probably isn’t all that great”. Shooting fish in barrels is not as much fun as catching them by fly fishing. You say you can’t find in the video where the guy says wind turbines sound like chainsaws? Maybe you don[t WANT to find it? Pay attention! Take notes! Really? Turbines are not moving and therefore make a pretty steady sound (if any) Jet planes ARE moving and, because of Doppler and changing distance from the viewer, make a sound that is NOT constant. The only “turbulence” here is caused by your ignorance of science and confirmation bias. Please go away! My own experience with wind turbines is that from a thousand feet away or so, when the wind and angle is just right, they sound sort of like a jet airplane flying by. Perhaps it’s turbulence caused by a gust of wind. Whatever you think you heard it wasn’t the turbine. The analogy with a jet engine makes no sense at all, in terms of physics. The energy expended per unit volume of air for the engine is orders of magnitude higher. The more appropriate comparison would be sound made by an engineless glider. At 100 feet in 40 knots for turbines of Falmouth which are smaller than most today, so turn faster, there was an audible flutter, but I had to really work and move around to keep it within hearing. The “health impacts” these windbaggers are bringing forward can only be explained with the nocebo effect. Onshore wind and solar are already the cheapest source of energy. So any enterprises fostering conventional energy generation which are still going forward can only be explained with massive corruption. In Frankfort Illinois where I live, there was a proposal for a community solar project that took about a year to get a final vote on it. On the land commission they voted it down 3 to 2 based on what, I couldn’t really wrap my head around it. It just seemed petty. It went to the town board and I watched it be voted down again 3 to 3. 4 was needed to win. The reasons for voting against it weren’t in the least bit sound. The investor had 4 advisors at the land commission and 2 at the town board. All questions were answered professionally with the investor willing to make whatever changes the town would want. I left the meeting wondering what was the reason it failed. I couldn’t put my finger on it. I was pissed that night. It’s interesting that some physical effects are real and measurable in experiments when the subjects were told that the low frequency sound waves might cause symptoms even though they were not exposed to any. So it’s not “all in their head,” but it was put there first. Pretty insidious strategy. ‘The cities, states, companies, and countries that move fastest to run their economies on fuel that is abundant and free, will clearly lead the new century.’ The trouble with wind is, it alternates between abundance and dearth. Last year, when high pressure systems settled over Europe, there were periods of over a week when the wind industry in half a dozen countries around the North Sea could only manage ~ten percent or less of nameplate capacity. The only way to fill the gaps at the moment is with fossil fuels. That’s why gas companies, in particular, do not view wind as a threat. Dong Energy, for example, one of the majors in offshore wind, is actually ‘Danish Oil and Natural Gas’. GE, which has a thriving wind turbine division, makes most of its money from gas turbines. Even 100% WWS Mark Jacobsen doesn’t think storage will do the job, so full decarbonisation will have to wait for continental and super-continental power grids to be installed. One reason for the hostility to wind farms in Ontario was that a previous Liberal provincial government imposed them in areas which didn’t really want them, and then had to put in gas plants to back those up. A grid which had provided very cheap, and very low carbon, nuclear and hydro electricity, was saddled with paying for new wind and gas plant, and new transmission lines, all under-utilised, at the same time as demand was falling. Household bills rose at unprecedented rates, and the Liberals were slung out of office. (a) DONG has deliberately and LOUDLY changed its name, to Oersted, and put that forward as a beautiful promotional piece, for exactly the opposite reason you are claiming. (b) Storage is the most stupid way of dealing with energy intermittency. The proper way is a dynamic, predictive, digital-enabled grid, considering both energy availability and energy demand, by computational predictions. Sure, maybe storage and even minimal natural gas generation might fill in the gaps. But, the trouble is, the greedy owners of natural gas want to be assured of minimal annual revenues, they cannot be assured. Not under the intermittency of renewables. After all, the purpose of renewables is to drive those errors or residuals between need and supply to zero. How’s that a model for hugely expensive natural gas? (c) “… in areas which didn’t really want them …”. Back in the day, there were farmers in the vicinity of the Tennessee Valley Authority (TVA) who were, at their own expense, invested in wind supplements to their own electrical energy and, by statute, were told they had to buy electricity from the TVA instead. (d) The “very cheap” energy of Ontario was paid for, indirectly, by the penalties imposed upon everyone else to support it. Sorry, I don’t give a frig about Ontario, and I don’t see why I should expend even a penny to help them. (e) Have you any real idea of what nuclear actually costs? It is in no way cheap, and is some of the most expensive energy available, once all the development and construction capital costs are factored in. Indeed, this is exactly the point: Renewable energy costs, while seemingly high at first, are actually low once all the attendant costs for fossil fuels are properly accounted for and allocated. Indeed, for example, natural gas electricity plants demand natural gas pipelines and the implicit subsidies from eminent domain takings. (Ask the U.S. Amtrak how easy that is.) Natural gas electricity costs discount completely the impacts upon the localities where the gas is obtained, whether this is from local seismicity or water contamination from fracking or flaring of incidental emissions, or losses due to imperfect transmissions along the way, these emissions having 100x CO2 greenhouse gas effects for CH4 in comparison. That “household bills” increased suggests the costs were not appropriately apportioned. Indeed, a business ought to bear ALL the costs of its adventure, and not depend upon government subsidy, that is, in fact, if one is actually, as opposed to politically, a free market capitalist. Moreover, the problem is more that control of energy supply is centralized, and a key aspect of defeating this obvious nonsense is the decentralization of energy supply. If one wants to take back control of one’s democracy, the key place to start is to take back control of energy supply, despite the arguments one hears about large scale efficiencies and the like. Centralization of energy supply means centralization of political power. Break the centralization and move it down to villages and households, and that stranglehold on political influence goes away. This is precisely why decentralized solar PV is such a win: It is easy. It is quiet. It is cheap. It is independent of anyone’s utility. The ideal would be, sure, grid independence, and, yes, we’re not there yet, but it’s coming. Put the provision of energy down to the council or town level, making their collective decision to be independent of utilities, and you’ll see things happening. And this is particularly compelling for suburbs. ‘It is easy. It is quiet. It is cheap. It is independent ‘. That’s wonderful, until you need heat, light, or cooking on a cold winter’s evening. The area of ‘ no sun ‘ is about 12,000 miles across, nightly, but temperate areas can get about 20% as much in the middle of winter as they do in the middle of summer. Cloud also reduces ouput by up to ninety percent. Wind has a higher capacity factor, but it’s hardly a localised industry – if you’re not relying on fossil backup, a grid will have to stretch across about three average anticyclone diameters to have a better than even chance of your western neighbour backing up the eastern one. I’ve seen weather charts where the nearest tight isobars to Western Europe were in Greece and southern Russia. What government of sane mind would build enough capacity that far away, and depend on it to keep their trains, hospitals, water pumping plants, food refrigeration,and industry, from powering down ? The difference between an advanced country, and somewhere like Congo or the Gaza strip, can be measured pretty accurately by the reliability of the power supply. Proponents of the German Energiewende are fond of saying that their power is more reliable than ever. Maybe so, but they’re still burning more lignite than any other country – and their biggest source of ‘renewable ‘ power is biomass, which is arguably just as bad as coal. It’s burnt in converted coal plants, and produces more CO2 per kilowatt, as it’s a lower grade fuel. According to some studies, even after fifty years, carbon neutrality is not approached. This video of real-time generation in Europe for 2017 shows that the countries with the greenest power, by far, were those with majority hydro and/or nuclear – Sweden, Norway and France. First, continuing the present model of power provision, meaning a centralized grid giving the same high quality electrical power to all, does mean failing some imagination. Most consumers of electrical power, including fans and motors and heat pumps, do not require electricity with the tight tolerances of frequency and voltage currently managed. This is so fundamental to the North American grid that deviations from nominal frequency are used as a grid wide control signal. Modern motors like EV motors use square wave pulse width modulated DC power. The present grid also suffers large interconversion losses, energy generated which helps no one. It could be massively decentralized. Second, the act of imagining, designing, and building a set of systems which span thousands of kilometers us a warm-up exercise for what is increasingly apparrent will be a necessary, mammoth globsl system to capture and fix CO2 from clear air, something which will only be affordable if the technology price performance improves 100X or more and we zero Carbon emissions. Third, the transition to wind, solar, and batteries is inevitable for economic reasons alone, with industry and the wealthy abandoning the grid for greater economic efficiency, doing it unilaterally in the absence of central plans to convert wholesale otherwise. Of course, the engineer wants to “fix” things with technological pies-in-the-sky while refusing to discuss one of the the real problems—-COAL in CHINA, INDIA, and SE ASIA. Here’s that piece I posted on his blog (Hypergeometric) that he absolutely refused to read or discuss and actually banned me for pursuing. UPDATE! I had suggested that all go view that exchange to be entertained, but it has been wiped! Comments I made on other hypergeometric threads were also “cleansed”—-It’s as if DOG never existed in ecoquack’s world. I am SO glad that ecoquack has decided to spend more time on Crock so that we can all be exposed to his foolishness here and attempt to educate him. I did not say they were “bad” and their comparative undesirability isn’t primarily because of the concrete: It’s the negative learning curve. That makes them in need of huge subsidy to compete with technologies which have logistically decreasing costs. The concrete just means that they need to operate a good long time before they are a wash on CO2 emissions. And, yes, in comparison to any other zero Carbon technology, excepting hydropower. Glad I could straighten that out for you. You are straightening out nothing for anyone, quacky. “Comparative undesirability”? The negative learning curve is meaningless when weighed against whatever value can be assigned to avoiding the extinction of much of the life on the planet. BTW, have you noticed that the expense curve for nuke costs looks very much like the “hockey stick”? And it would help if you posted your reply with the comment it was directed at—this wasted effort of yours was intended for my 10:28 AM comment, not the 10:46. I know that abstract thought and proper use of the English language are sometimes difficult for engineers, but putting a bolt in the right place should be a goal for you—otherwise your “edifices” will collapse. PS Still waiting for you to take up the invitation to discuss COAL. This is not hypergeometric where inconvenient truths can be made to disappear. Well said. The future for hydro is limited, but there are still many places where nukes could be sited. Plenty of new reactor designs to choose from, also. It’s too bad that we haven’t yet asked the question “What price do we put on saving the planet”? If and when we decide that nukes are NOT actually “too expensive”, it will likely be too late. Here’s ecoquack, wandering around the barnyard behind the Demented Rooster and spouting BS. I may have to design an “ecoquack suit” for him so that he will be properly dressed for the ignorance parade. Nukes are bad because of all the concrete they require? ROTFLMAO! Here’s a piece that is a bit old (2007), but speaks to that piece of “I am a injuneer” stupidity. What is so dammed hard about understanding that the world is heading for catastrophe if we don’t do some thing now! Below is a very informative talk which is not anti renewable s as the title suggests. It is also quite entertaining. I am not anti renewable. Build wind towers by the forest and flood hydro sites even if somebodies church is drowned. Then fill in the gaps with non polluting nuclear and in all cases stuff manipulated statistics and ‘costs’. Excellent talk by MacKay. Helps remind us how complicated the equation really is. I prefer some wind turbines in my back yard to a nuke. And I think I’m not the only one. BTW, nuclear has about ten times the carbon footprint of wind. Most studies dealing with the carbon footprint of nuclear just omit decommissioning as it is “too far in the future” to be properly calculated. I just recall Sellafield and Greifswald. I call your comment BS as you cannot backup one single claim you make. Nuclear is way too slow to respond to the oncoming climate crisis. So it’s quite easy to conclude where investments should go and actually ARE going to. Here is one of these “independent estimates” which influence meta studies and Wikipedia. It rather reads like a day dream of EDF, the French nuclear operator. Apart from the fact that other greenhouse gases from CO2 are not incorporated, the estimate of 4-6 gCO2e/kWh is ridiculously low and pulled out of thin air. Chas. Get out of your bubble and watch MacKay to back up my claims! We could build nukes in the mid 20th century, we can certainly build them two decades into the 21st. All it requires is the WILL, that is the WILL, and less holier than thou laypersons throwing up dogmatic barriers. And to hell with the cost and other bleating s, there is a damn world to save. By now we should know where investments are meaningful. And if you don’t care about decommission, if future costs and a toxic legacy lasting hundreds of thousands of years don’t count for you, then I don’t know why you actually care about climate change. All I read from Brent is MacKay, MacKay, MacKay. And then “Get out of your bubble”. Sorry. I’m too pragmatic for daydreams. Better invest in renewables than in a 20th century technology which has failed at many stages. Too slow, too risky, too expensive, too toxic. While it is true that northern europe had a wind drought this summer, you left out the more important fact. PV production broke all records because the persistent high pressure weather was cloudless. SO, to best handle wind intermittency, it is simply a matter of adding enough PV, ground source heat pumps, and various forms and modest amounts of storage, and a small amount of FF PP with CO2 capture and storage. Yes that’s an excellent start, but need to zero and Carbon capture agriculture, transport, and especially consumption, as, for example, this statutory holiday dedicated to it. Admittedly, it’s much worse in some places than others. Actually, all we need to do is build enough RE tech to eliminate the burning of carbon which is extraneous to the natural carbon cycle. That means the burning of fossil fuels, which are sequestered underground. At that point, consumption and agriculture are not an issue any longer, because the supply of sun and wind are infinite to our needs, and agriculture is part and parcel of the gigantic natural carbon cycle. Alas, I wish it were so. Unfortunately, agriculture without fossil fuel planting, harvesting, processing, and transport is a tad under 3GtC of 10 GtC emitted annually. Might save some if didn’t use petroleum-derived fertilizers. And, as mentioned, there’s cement associated with development. This is one reason, why, as The Economist recently reviewed, people are looking at using wood-derived skeleton to replace much of high rise buildings. Agriculture , without FF and synthetic fertilizer, is exactly the same as a pristine primeval world without humans. You can toss around all the gigatons you want – the natural carbon cycle is gigantic compared to even human FF emissions – which is why it has taken more than a century to raise CO2 levels as much as we have. Want to hear something staggering? Termites produce way way more CO2 than the transportation sector, and also produce a significant percentage of the methane associated with livestock. But the EPA does not consider them a carbon source – because they are “natural”, ie, part of the “natural” carbon cycle. Think about for a while. Btw, there is a recent article somewhere about the discovery of a gigantic termite community in Australia or Africa that is, IIRC, ten times the size of London. Quadrillions of bugs. Which could be wiped out with a few trainloads of poison, and nobody would give a single flying frack. But…… no. Let’s talk about the evils of livestock, which feed and clothe the human race. Ixnay on the ermite-tays. Been drinking that Vermont maple syrup vodka again, GB? Yes, termites ARE “natural” and they’ve been around a LOT longer than humans, especially the humans that have done all that UN-natural burning of fossil fuels. And “nobody would give a single flying frack” if we killed them with a few TRAINLOADS of freaking poison? Sorry, Mother Nature would care, and she’s already pissed at us. FYI, many of the termites in AUS are grass-eating, and fill the ecological niche filled by grazing mammals in other places. It’s a balance of nature thing. Termites are natural, while livestock are… synthetic. Got it. One is a nature-in-serene-harmonic-balance thing, of immense eternal beauty; while the other is a skull-and-crossbones artificial pollution source, oozing with unhealthy detriments. One is NOT a carbon source, because people don’t raise them on purpose, nor do we eat them. (Aardvarks eat them, but they don’t count either). It is NOT a carbon source, even though it produces *10 times more atmospheric GHG CO2-eq* than the other one. And the other one… is, yes it IS a carbon source… because people eat them. And that is NOT natural. Filthzee people-zes! Yes, DOG, I… I… I am beginning to see the light! You were right, so very very correct!! And it is beautiful, so very very beautiful!! Such light, such beautiful radiant light! Mother Nature is bathed in a pure pure light, so natural, so pure and it is so beautiful, so very very beautiful!! Behold her, you filthy human, in all her natural Glory of pure white balanced Light!!! Dang, hitting the Vermont maple syrup vodka at 5 AM is not a good thing—-MRS. GB! !—-take the bottle away from him! Sober him up! Then explain to him how industrial farming of animals (and crops as well) is definitely NOT “natural”. Good grief, man, you are obtuse this morning. Agriculture is perfectly natural – to *the carbon cycle*. The carbon cycle has to do with the movement of carbon between the air, and the biota, and the seas, and rocks. Once that carbon becomes fixed into stone or coral or underground fossil fuel deposits * it is no longer part of the carbon cycle. * It is, as they say, “Sequestered”. From the aspect of the terrestrial carbon cycle, it doesn’t matter one whit whether an atom of carbon, which was scrubbed from the air as CO2, got incorporated into a molecule of cellulose, and was then released as part of a molecule of respired CO2 or respired methane gets respired by a termite or a beef cow. Or if it stays as grass until the grass rots away into CO2 and methane by the action of fungi or bacteria. It doesn’t matter because no matter how that carbon goes from atmosphere to biota to atmosphere, it stays part of the carbon cycle. Until it gets sequestered away into coral or stone or a fossil fuel. So the EPA is simply wrong to say => =>*on the basis of the carbon cycle* <= <= because that was their reason) that termites should not be counted as a source of GHG but cows should be. Again – the key issue here is the re-introduction of formerly sequestered carbon by the burning of fossil fuels. That increment is the cause of the imbalance that is overloading the carbon cycle and causing AGW. Any “slowness of speaking” is not on my behalf, GB—-it’s caused by all that Vermont maple syrup vodka you’ve been imbibing. Why do you refuse to accept that industrial farming of animals (and crops as well) is definitely NOT “natural” and over the past few decades has moved us beyond what the carbon cycle has evolved to deal with over many hundreds of millions of years? You are sober enough to state “…the key issue here is the re-introduction of formerly sequestered carbon by the burning of fossil fuels. That increment is the cause of the imbalance that is overloading the carbon cycle and causing AGW”. Keep drying out—-there is an “ethanol metabolism cycle” that will remove the thought-clouds soon enough. Come back and talk to us once you’re fully sober. Auto repair shops will go away. A gasoline engine has 20,000 individual parts. An electrical motor has 20. Electric cars are sold with lifetime guarantees and are only repaired by dealers. It takes only 10 minutes to remove and replace an electric motor. Faulty electric motors are not repaired in the dealership but are sent to a regional repair shop that repairs them with robots. Your electric motor malfunction light goes on, so you drive up to what looks like a Jiffy-autowash, and your car is towed through while you have a cup of coffee and outcomes your car with a new electric motor! Gas stations will go away. Parking meters will be replaced by meters that dispense electricity. Companies will install electrical recharging stations; in fact, they’ve already started. You can find them at select Dunkin Donuts locations. What happened to Kodak will happen in a lot of industries in the next 5-10 years and, most people don’t see it coming. Yet digital cameras were invented in 1975. The first ones only had 10,000 pixels, but followed Moore’s law. So as with all exponential technologies, it was a disappointment for a time, before it became way superior and became mainstream in only a few short years. It will now happen again (but much faster) with Artificial Intelligence, health, autonomous and electric cars, education, 3D printing, agriculture and jobs. UBER is just a software tool, they don’t own any cars, and are now the biggest taxi company in the world! Ask any taxi driver if they saw that coming. Ask Hilton Hotels if they saw that coming. This year (2018), a computer beat the best Go-player in the world, 10 years earlier than expected. In the USA, young lawyers already don’t get jobs. Because of IBM’s Watson, you can get legal advice (so far for right now, the basic stuff) within seconds, with 90% accuracy compared with 70% accuracy when done by humans. So, if you study law, stop immediately. There will be 90% fewer lawyers in the future, (what a thought!) only omniscient specialists will remain. Autonomous cars: In 2018 the first self-driving cars are already here. In the next 2 years, the entire industry will start to be disrupted. You won’t want to own a car anymore as you will call a car with your phone, it will show up at your location and drive you to your destination. You will not need to park it you will only pay for the driven distance and you can be productive while driving. The very young children of today will never get a driver’s license and will never own a car. Look at what Volvo is doing right now; no more internal combustion engines in their vehicles starting this year with the 2019 models, using all electric or hybrid only, with the intent of phasing out hybrid models. Electric cars will become mainstream about 2030. Cities will be less noisy because all new cars will run on electricity. Electricity will become incredibly cheap and clean. Fossil energy companies are desperately trying to limit access to the grid to prevent competition from home solar installations, but that simply cannot continue – technology will take care of that strategy. Health: The Tricorder X price will be announced this year. There are companies who will build a medical device (called the “Tricorder” from Star Trek) that works with your phone, which takes your retina scan, your blood sample and you breath into it. It then analyses 54 bio-markers that will identify nearly any Disease. There are dozens of phone apps out there right now for health purposes. WELCOME TO TOMORROW – it actually arrived a few years ago. Let’s see—what else has “arrived” lately? An opioid epidemic, a suicide epidemic, reduced life expectancies in the USA, ever-increasing wealth and income inequality, increasing racism-misogyny-xenophobia, disrespect for the rule of law and the moral imperative of the greater good, and an over reliance on “technology” as a cure-all, to name just a few. And the Dumpster Fire in the Offal Office is as much a symptom of the decline of the USA as a cause. If this “tomorrow” described here doesn’t arrive VERY soon (assuming it will cure much even if it does), the SHTF explosion of catastrophic climate change and the worldwide disruption it will bring will keep it from happening. People who can’t find enough to eat are not going to be worrying about their Tricorder X keeping track of their starvation. ‘Solar production has been on an exponential curve for 30 years, but you can now see the burgeoning impact. Not in the countries with the highest percentage of their power from it. In Italy and Greece new installations have practically stopped. They would have in Germany too, if the planned reduction in the feed-in tariff had gone ahead. Those countries get up to about eight percent of their power from solar, and the s-curve has already flattened out. Places with high installation rates are starting from a much lower base. Those with a poorer solar resource than deserts like Saudi and northern Chile will hit the clear limitations of such a dilute and unreliable power source sooner. Solar is “dilute” and unreliable”? Is that so? Seems to me the sun still rises every morning like clockwork. And the average isolation is 1.3 Kw per square meter. If solar installs have slowed or stopped, it’s not because of the source or the tech – it’s for other reasons. One of those reasons is disinformation campaigns, where assholes visit energy blogs and try to convince people that solar is “dilute” and “unreliable”. ahhh, if only solar pv and wind electric were renewable… and if life went on forever. but sadly, the god of technology cannot mitigate the limits to growth on our finite planet any more then jeebus can mitigate finite lifespans… and these foolish attempts only dig the hole deeper. Negative externalities do eventually get priced in, but, if neglected for sufficiently long, via Minsky Moments rather than anything smooth. A bit OT, but relevant in that our friends on OZ are perhaps the country most at risk from climate change on the planet. The foxes are migrating south to cooler climates. It’s not working. To Greenperson and the real people on Crock, all the beast for the new year. Solar and wind are NOT renewable? What are you smoking – I want some. i am smoking the reality that solar pv and wind electric are 100% dependent on the underlying, hydrocarbon powered industrial infrastructure. after 35 years in the industry, basically solar is a bunch of fossil fuel created hardware which every few years needs more fossil fuel created hardware to keep the system operational. how can something dependent on non-renewable resources be “renewable”? sorry. there is no free lunch and technology cannot mitigate finite planet realities. The climate-friendly electricity generated by solar panels in the past 40 years has all but cancelled out the polluting energy used to produce them, a study said Tuesday. Indeed, by some calculations, the so-called “break-even point” between dirty energy input and clean output may already have arrived, researchers in the Netherlands reported. “We show strong downward trends of environmental impact” of solar panel production, the team wrote in the journal Nature Communications. The study sought to address concerns that solar technology may be using fossil fuel energy in the panels’ manufacture, and emitting greenhouse gases, faster than it was able to offset. The authors found that for every doubling in solar capacity installed, energy used to produce solar panels decreased by 12-13 percent, and greenhouse gas emissions dropped by 17-24 percent, depending on the material used. Such calculations are a trifle complex. Easier to consider costs which have a basically direct relationship to energy and material input. Solar PV pays for itself very quickly, ergo energy out beats energy in equals goody. Nothing is quite that simplistic, however the above article appears overly pessimistic. Physical materials used still exist in a different form, no worries. jeff, how long have you lived with “magic green” hopium? many people think we can mitigate the “Limits to Growth” with technology, but that is a fool’s errand we attempt at our own demise. the reality is that “magic green” intermittent energy capturing devices cannot exist without the underlying, unsustainable, fossil fuel powered, mining and manufacturing industrial infrastructure. i just finished a 30 year career designing, installing AND MAINTAINING solar electric systems and i can assure you they are neither “green” or “renewable”. most people promoting “clean, green” solar, have not lived with it long enough to experience the lifecycle costs. in my personal case, my oldest working module is from 1987. it is severely delaminated but still making usable power and is a part of my grid tied with battery backup system… BUT there is the issue of the mean time between failure of inverters which is around 5 to 7 years. batteries and charge controllers also have similar, finite lifetime realities. if i had to pay for someone to do my repairs, the system would never make enough money in reduced power bills (@ .17/kWh) to pay for the ongoing maintenance… let alone the imbedded energy involved the equipment’s manufacturing. so basically a typical solar electric system is a bunch of expensive, high tech, fossil fuel created equipment that every few years needs more expensive, high tech, fossil fuel created replacement parts to keep operational. another sad reality is solar retailers and installers make more money installing larger systems, which incentives waste. add to this the fact that no one is interested in reducing their consumption or changing their behavior, so energy audits are a thing of the past. this means solar is basically about enabling waste and justifying non-negotiable lifestyles. that being said, while incredibly expensive to purchase and maintain (a clear net loss), i do enjoy the resiliency they provide our “lifeboat”. without solar pv, in a “no-grid” scenario, we would not be able to pump water for food growing operations. We are living in a failed energy system. Either we go with fossil fuels and destroy our climate or we go with basic solar wind hydro energy system and stay within the limits of living on earth. We will have problems no matter what direction we take, but it is better than the dire situation we create with fossil fuels. And then renewable energy can improve while FF is a dead end way to go. Why don’t we care about climate change? Excellent find, Chucky—-much better than your usual “blind squirrel looking for acorns” stuff. I would argue a bit with “Nicotine addiction doubtless helped slow smoking’s fall. So did corporate marketing. But more fundamentally, it was psychology at work”. As a former smoker, IMO, nicotine addiction is THE big factor in trapping smokers, not psychology. 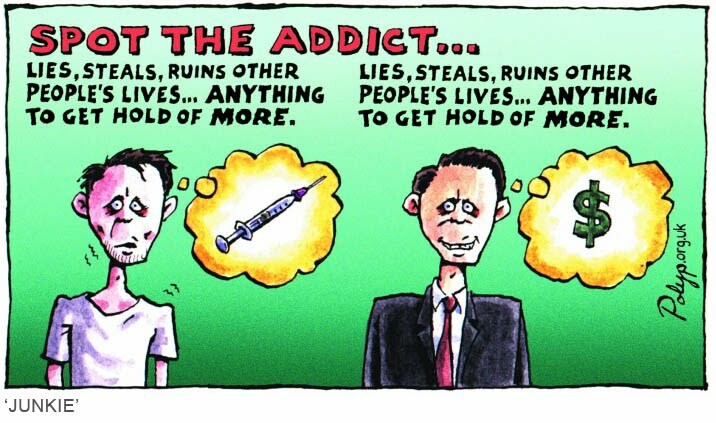 You can extend that into the “addictions” of modern society, which result in our continued need for fossil fuels. You can extend that to wherever you want to, grumpo.